CPO 3rd month Mac futures contract traded RM20 points higher as compare to previous trading sessions to close at RM2702 with a total of 8,912 lots traded in the market. CPO price manage to surge higher despite soybean oil and crude oil overnight and electronic trading were traded weak. 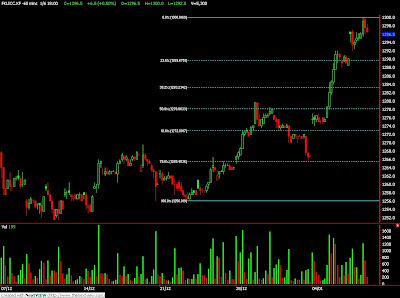 CPO price traded lower before end of session due to minor profit taking activity. CPO price encounter some selling pressure at 300% Fibonacci resistance level at RM2726 regions before traded lower to form wave 4 which manage to reach 61.8% Fibonacci support levels at RM2694 region. Technically, CPO price is likely to surge higher in the coming trading sessions provided support levels at RM2690 and RM2673 regions were not violated during trading sessions. CPO price would encounter some great selling pressure around resistance level at RM2735 and RM2760 regions; both are 178.6% and 250% Fibonacci resistance levels in the CPO hourly price chart. FKLI Dec Futures contract surge 6.5 point higher to settle at 1296.5 levels as compare to previous trading session to with a total of 5,300 lots traded in the market. FKLI opened higher out of expectation as Dow Jones was traded weak during overnight trading. FKLI continue to surge higher despite most of the regional indices were retrace before end of session due to some profit taking activity. 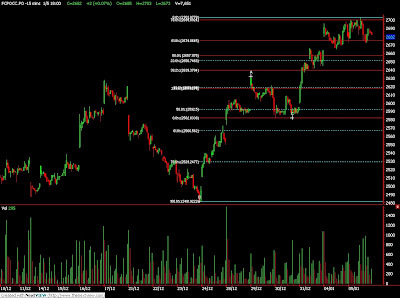 FKLI manage to overcome previous resistance levels at 1292 regions and test 250% and 150% Fibonacci resistance level at 1300.5 regions twice in the hourly price chart. 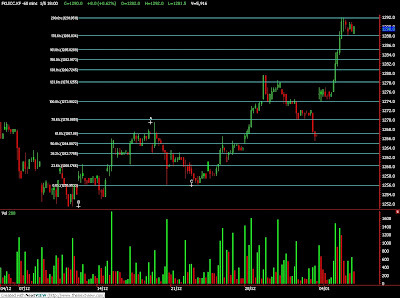 Technically, it’s view that FKLI more likely riding wave count 3 instead wave 5; which 123.6% Fibonacci resistance level at 1300, as hourly price chart still haven’t show any sign of divergence. However, FKLI would expect much selling pressure around resistance levels at 1303 and 1312 region in the coming trading sessions. FKLI traded price are more favorable to hold above support at 1278 and 1269.5 in order for Bull rally to remain intact firm with current market situation. FKLI Dec Futures contract surge another 8 point higher to settle at 1290 levels as compare to previous trading session to with a total of 5,916 lots traded in the market. FKLI traded higher since open for trading in the 1st trading sessions but traded sideways in the 2nd trading sessions despite Hang Seng Indices closed strong upon closing. FKLI penetrate and holding above previous resistance levels at 1287 during entire trading sessions while met 200% Fibonacci resistance level at 1292. Technically, FKLI view as bullish sentiment as it manage to penetrate previous high at 1286 regions while other condition such as support levels at 1269.5 and 1256 must not be violated in the coming trading sessions must be fulfilled. However, FKLI seen traded on the top side and pull back would anticipate provided resistance levels at 1292 and 1301; both were 200% and 261.8% Fibonacci resistance levels. CPO 3rd month Mac futures contract traded marginally RM2 points higher as compare to previous trading sessions to close at RM2682 with a total of 7,651 lots traded in the market. CPO price seems traded sideways to search for firm support and resistance within range despite crude oil and soybean oil were traded firm during overnight sessions. CPO price manage to meet 78.6% Fibonacci resistance levels at RM2700 regions and traded lower after fail in attempt to penetrate resistance levels at RM2700 regions. 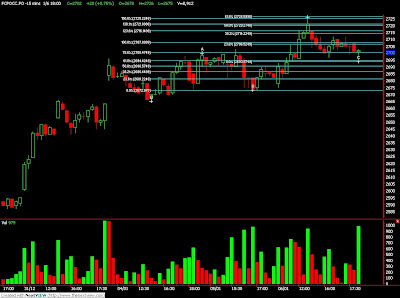 Technically, CPO price seems break down from at rising wedge in the 15min price chart but seems temporary supported above intraday low during trading sessions. CPO price would anticipate further correction in the coming trading sessions provided resistance levels at RM2700 and RM2732 were not violated in any attempt to break higher. However, CPO price will remain intact with bull rally with condition support levels at RM2592 and RM2482 were not violated during trading sessions.